Join me on Saturday 5 May at the Park Inn Hotel, Heathrow, UK to empower yourself, gain great confidence and boost your self-belief at this special event. It’s a fun yet powerful way to bring out your inner brilliance! Life Mapping is a unique personal empowerment system to help you be your very best in yourself as a person, so that you do your best in all your various activities, and have your best results. How does Life Mapping work? The Life Mapping technique guides you in creating a map of you being your best, Mentally, Emotionally, Physically, Financially, Socially and Spiritually. 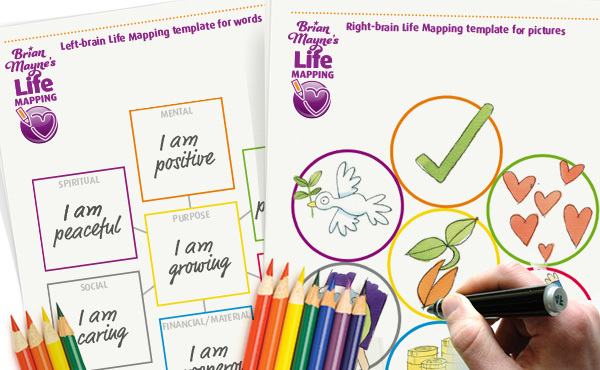 By using words and pictures, your Life Map helps activate both sides of your brain. This powerfully commands your subconscious autopilot to increase your self-confidence, raise your self-esteem and boost your self-belief. Your Life Map will help you to think your best thoughts, which will trigger the chemical release that gives you your best feelings, and influence you into taking your best actions, so that you live your best life. What is the Life Mapping Event? My 1-day Life Mapping Event is a great way to learn about Life Mapping together with a group of like-minded people. Join this 1-day workshop to learn the principles of success for yourself and life, and create a Life Map to be your best and live in harmony with the fundamental principles of creation.